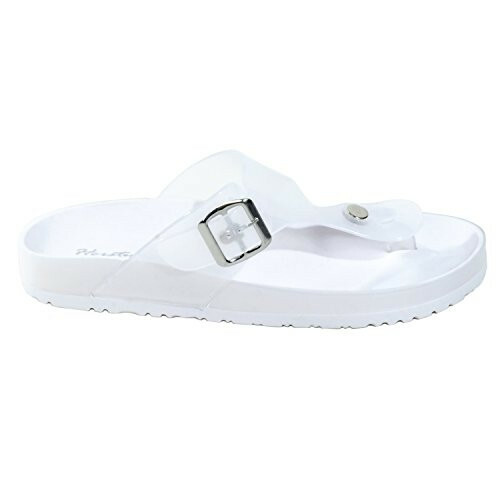 Everyone knows that a molded footbed makes for a super comfortable sandal that you can practically live in. Now you can get that comfort in our Baude jelly sandal that comes in great summer colors and sports a bold buckle on the side. Great for all your casual activities - camping, a picnic, walking the dog, running errands, or just sitting around looking cute. You can even pair these with a simple gauze sundress, sarong, or beach pants for an ultra-trendy look that still puts your convenience first. Available in black, green, and white, sizes 5 to 10, no half-sizes.